Explanation: After closely following comet 67P/Churyumov-Gerasimenko for 786 days as it rounded the Sun, the Rosetta spacecraft's controlled impact with the comet's surface was confirmed by the loss of signal from the spacecraft on September 30, 2016. 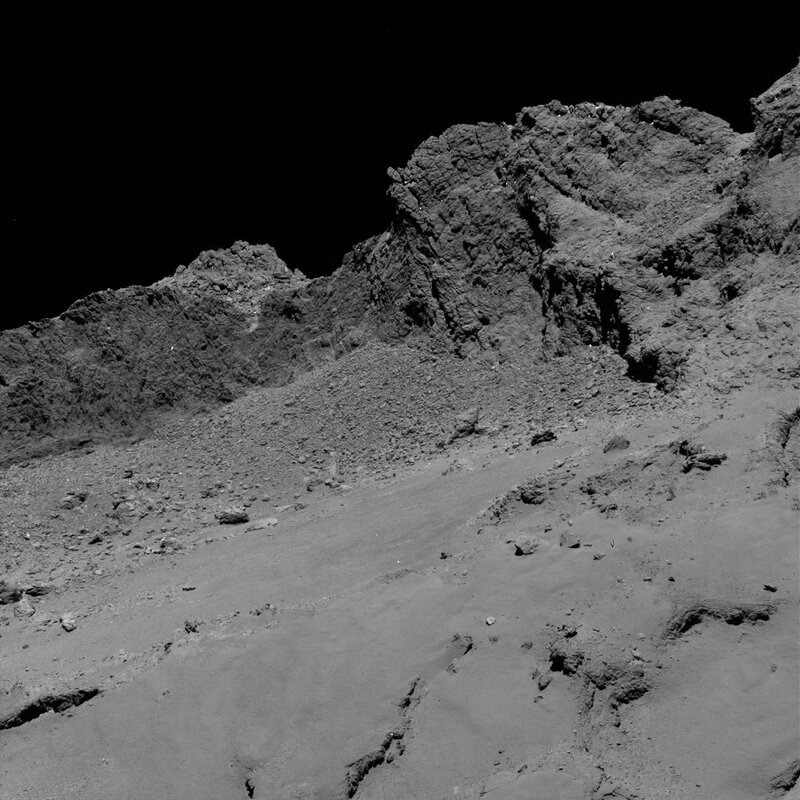 One the images taken during its final descent, this high resolution view looks across the comet's stark landscape. The scene spans just over 600 metres (2,000 feet), captured when Rosetta was about 16 kilometres from the comet's surface. Rosetta's descent to the comet brought to an end the operational phase of an inspirational mission of space exploration. Rosetta deployed a lander to the surface of one of the Solar System's most primordial worlds and witnessed first hand how a comet changes when subject to the increasing intensity of the Sun's radiation. The decision to end the mission on the surface is a result of the comet's orbit now taking it to the dim reaches beyond Jupiter where there would be a lack of power to operate the spacecraft. Mission operators also faced an approaching period where the Sun would be close to line-of-sight between Earth and Rosetta, making radio communications increasingly difficult.